St David’s is an island at the extreme South-Eastern point of Bermuda (now joined by bridges) and separates Bermuda’s only two naturally navigable harbours, St Georges Harbour and Castle Harbour, the former first navigated by Sir George Somers in 1610 and the latter first navigated by the Spanish galleons of the 1500’s. The St David’s Lighthouse mounted on the highest point in St David’s (William Strachey’s Watch; he was the Secretary at Jamestown, Virginia and on the Sea Venture) provides breathtaking views of the reef line and the only navigable approaches to the island by ship from the NE to the SW. From here you can see the sites of many shipwrecks the most notable of which are the Sea Venture (1609), the Warwick (1619), The Sea Flower (1624), Cristobal Colon (1936) and the HMS Cerberus (1783) all of which have fascinating stories to tell. St David’s is known for its people of which only a few genuine St David ‘s Islanders remain today – the St David’s Islanders were either your best friend or worst enemy; fiercely independent and self-sufficient they were sailors, shipwrights, fishermen, farmers, whalers, builders and pilots. You can learn about these people and St David’s at Carter House and Museum located at 34 Southside road, St David’s. Carter House also features a Settlers Cabben circa 1612 (the first Governor’s house in Bermuda!) and many Bermuda roses, endemic and native plants and trees – what Bermuda looked like it in its first 100 years. A place where history speaks to you. 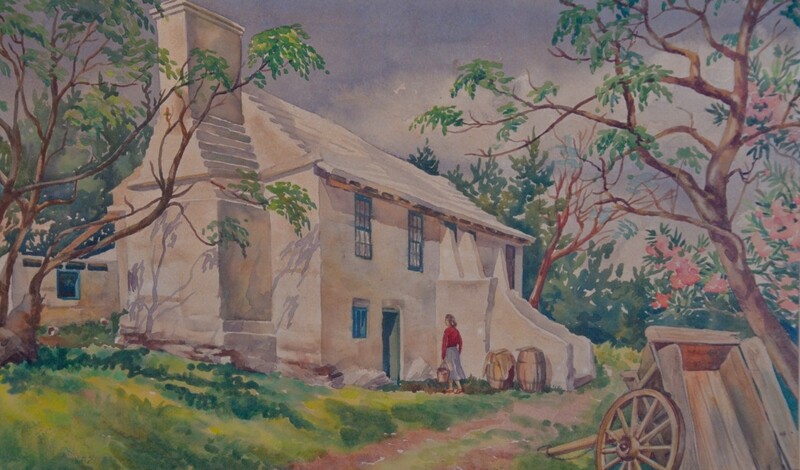 Carter House is named after Christopher Carter’s granddaughter (Martha Hayward), who lived there and died at 114 years old in 1791. She made Palmetto hats for Queen Ann and Carter House has an excellent collection of Palmetto hats and other items. Christopher Carter was on the Sea Venture when it wrecked in 1609 and he became the “first Bermudian” being the only one on the Sea Venture to make Bermuda his home. He owned Coopers Island and died on the Sea Flower which exploded in Castle Harbour in 1624 just below Carter House. St David’s was mostly subsumed by the US Base, constructed in 1942, which now provides our very important airport. The US Base withdrew in 1995. Many St David’s Islanders were displaced in 1942. Many beautiful islands, bays and beaches were destroyed and filled in for the airfield. Coopers Island was joined up to the mainland by the runway. One Southside bay/ beach Annie’s Bay and the beautiful underutilized beaches of Coopers Island, however, remain and the newly created Cooper’s Island Nature park is a beautiful place to walk and swim. Clearwater beach provides refreshments and a children’s park. The “Longtail” (tern) is abundant here in the summer and is one of the most beautiful and graceful seabirds in the world. This is a Cooper’s Island pink beach looking SE to Gurnet Rock which marks the entrance to Castle Harbor used by the Spanish and early sailing ships due to the “well marked” straight channel and protected waters. In addition to Coopers Island, there are other coastal walks well worth the hike, Great Head at the Battery (Bermuda’s last fort built in 1908 and the Lost at Sea Memorial) as well as Gunners Bay (the site of the landing of the Plough in 1612) to Fort Popple (ruin, built in the 1730’s). Nearby Governors Island and Paget Island have the remains of two very early forts (1612-14) built to guard the St Georges Channel with two cannons from the sea Venture. Also on Paget Island across the channel is the very interesting cast iron fort Cunningham. On the south side of St David’s Nonsuch island (next to Cooper’s Island) has been restored to an original Bermuda wilderness and is where the very rare indigenous bird, the Cahow, breeds which is unique to Bermuda. Next to Nonsuch is Castle Island on which the well preserved extensive fortifications of the early 17th century (the earliest surviving English forts in the New World) are well worth a visit if you can get on the island! A cruise around it will suffice for most. Smith’s Island is the site of several archaeological digs of undisturbed remains of early Bermuda’s first timber framed houses. Most or much of these Islands are part of the Bermuda Parks system or otherwise protected. TOURS of Carter House and/or St Davids by prearrangement are available: contact us at stdihs@icloud.com or call 441 293 5960. Transportation is not provided and always subject to the availability of our passionate guides.